Fig 1-6: The various stages of ablation. The organization of a cell is critical for its function and understanding how organization affects function is a major goal of cell biology. Researchers led by Dr. John A. Cooper at the University of Washington in St. Louis and Dr Alexey Khodjakov at the Wadsworth Center, Albany, New York used microtubule ablation to learn more about how cells use the cytoskeleton to integrate spatial information into cell cycle regulation. Budding yeast cells are one model organism used to study cell division. During division in the budding yeast, Saccharomyces cerevisiae, one end of the mitotic spindle is drawn through the bud neck to deliver a genome to the daughter cell. Cytoplasmic microtubules projecting from the spindle pole bodies carry out this process by interacting with the cell cortex to orient the spindle along the mother-bud axis and then move one spindle pole body through the neck and into the bud. The cell has quality control mechanisms in place in case this process goes wrong. For example, mutations can cause a delay in the movement of the spindle. In this case mitosis proceeds in the mother cell, but if things have not corrected themselves by anaphase a cell-cycle checkpoint mechanism known as the spindle position checkpoint will stop mitosis. Scientists have some understanding of how this checkpoint halts mitosis, but it isn't fully known how the checkpoint mechanisms detect that the spindles are not in the correct position to proceed. Previous work had suggested that dividing yeast prohibit cell cycle progression when the mitotic spindle is not adequately positioned between the nascent mother and daughter cells. This implies that the cell must monitor the position of the spindle, and interpret it relative to some other site, such as a landmark. 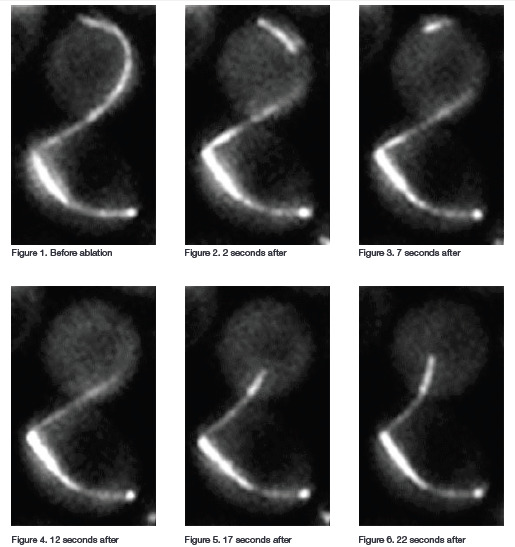 To test the hypothesis that cytoplasmic microtubules extending from the spindle to the bud neck are important for this process Cooper’s team interrupted microtubule interactions with the bud neck using laser ablation. The researchers used a MicroPoint pulsed laser system with its emission tuned to 539 nm to perform laser microsurgery of GFPlabeled microtubules in dynein mutant budding yeast cells. Dynein mutants cannot pull the spindle through the bud neck, and thus mitosis is stopped by the spindle position checkpoint. They had originally purchased the MicroPoint system to add a photobleaching / photoactivation module to their microscope, but the tunability of the system’s laser gave them the flexibility to also use the system to ablate microtubules in this experiment. MicroPoint allows the user to image the specimen during laser ablation and this allowed the researchers to visually target dynamic microtubules for ablation. Microtubules move quickly through the cell, so being able to observe the cell during ablation was critical for nimble targeting and subsequent verification of microtubule severing. monitored the spindle of these cells for up to 90 minutes to see if the cells remained arrested in anaphase. For imaging, they took timelapse Z series of the cells using an inverted fluorescence microscope with a 100 x, 1.35 N.A. oil objective lens, CSU spinning disk confocal scanner with 488 nm laser excitation and EMCCD camera for detection. The Z series covered 3 um in depth and were captured at 30 or 60 s intervals. When cytoplasmic microtubules in the bud neck were ablated most of the cells exited mitosis, showing that the absence of cytoplasmic microtubules in the bud neck activates the mitotic exit network. The researchers next performed experiments to find out if disrupting cytoplasmic microtubules not in the neck would disrupt the checkpoint. In checkpoint-activated cells with microtubules extending from one spindle pole body through the neck they ablated microtubules at the other spindle pole body (microtubules not extending through the neck). Most of these cells remained in mitosis. Finally, they did experiments in which they damaged the spindle pole bodies or severed microtubules near the spindle pole bodies. Neither of these actions prompted mitotic exit. Collectively these ablation experiments show that disrupting the microtubules that extend from the spindle to the bud neck cause the cells to fail to prohibit cell cycle progression and thus to exit mitosis. This suggests that the cytoplasmic microtubules are important for reading the position of the spindle upstream of cell cycle regulation. These findings have implications across species. They may be particularly important for the faithful distribution of genomes to proper regions of the cytoplasm during the asymmetric cell divisions that underlie metazoan development and the homeostasis of adult tissues.